When Alex was only 4 weeks old we made the big move from my apartment in the Netherlands to Stevens house in Letaba. I had been to Kruger on holiday many, many times. And spent weeks on end with Steven in Letaba. I even lived there with him part-time while I commuted back and forth between South Africa and Holland for my work as a cabin attendant. So I was by no means a newbie when it comes to living in the bush. But things change when you throw a baby into the mix! Because I was a total newbie when it came to motherhood and babies! And I had to figure everything out in a new and somewhat ‘hostile’ feeling environment. I mean: you don’t want anything to happen to your precious little one. And we had moved from cold, wet, ‘safe’ Holland where the most dangerous insect is a wasp, to the wild Kruger National Park; with extremely dangerous animals both big and small. But, I suppose a lot of things feel dangerous to your baby when you are a first-time mom. We moved in with Steven at the end of October and the summer heat was hectic from day one. If I remember correctly, the daytime temperatures were well into the forties that whole first month in Letaba. One day, with temperatures reaching 48 degrees, the bats that live in the bridge over the Letaba River got so hot inside they just needed to come out – only to cook on the boiling hot tarmac. There were hundreds of dead bats on the bridge, a sad, sad sight. I think that was the day we decided to spend my last Euros on a split unit for the living room. Steven was with me in Holland for 6 weeks before we moved. During his absence, a lot of ‘guests’ took up residence in the Letaba house. That first month we had a genet in the roof, monkeys broke into the house, and I found out that there was a rat living in our stove. We evicted both stove and rat and were without a stove for weeks! We had to give an eviction notice to two squirrels too. They had moved into the TV cabinet in our living room and were quite reluctant to leave. One morning we were sitting outside on our stoep when I saw a warthog casually stroll through our living room! She had broken the gauze of our sliding door and was walking in the house like it was her own. Steven chased her down the street with a whip! Then there were a bunch of red romans and scorpions that also needed to find new homes. Or that just needed to go live outside. Especially now that there was a baby in the house. I remember sitting on our bed breastfeeding Alex one night when movement on the lampshade next to me caught my eye. It was a tiny scorpion! I also found a spittlebug in Alex’ cot a sac spider in my bed and a snake in the crack in the stoep at our sliding door. Of course, most of these ‘incidents’ happened while Steven was on trail. So I had to handle it on my own. I have to be honest with you, after that first month, I sometimes wondered what I got myself into! Brown House Snake living at our sliding door. One of the biggest Red Romans we found in the house. We found this scorpion in the cupboard under the sink! But, one gets used to things I suppose, and a bit more confident in handling, or just accepting, the ‘guests’ in our home. This new mom and new resident of the Kruger National Park had some serious toughening up to do! Over time I learnt that not everything is going to harm my children. They are a lot tougher than we think. They can handle a bit of hot weather. And scorpions and other critters do not come into the house just to attack them. That does not mean we are not careful though! Yesterday, a little shadow under the door to the stoep caught my eye. Closer inspection revealed a scorpion! Our boys are extremely curious so I told them to stay in the kitchen and went to go fetch my trusted broom. A big sweep of the broom and the scorpion was outside. It immediately ran back inside! He was quite an aggressive little bugger that eventually took shelter in our doormat. I put the doormat with scorpion up against a tree – a much more suitable place for a scorpion to live! I think now, after more than four years in the park, there are not a lot of things that faze me anymore. The city girl from Holland that refused to eat outside as a child because she was scared of pretty much every single flying insect, got used to living out here in the bush. Seeing how my children grow up here, the way they love all the animals in this beautiful place, without the dangers of life in the city? I love it and would not change it for the world! Thanks, Pam! The Christmas tree is up! Holding off putting the presents under it, because Jack will open all of them! Lol! PS. A friend is visiting us on Friday and he will bring one of those aircon boxes from Game for me. I’ll let you know if they are any good! What’s Cherman? I have been asked…well it is not actually anything…!! Haha, Erik!! I think you mean the German word ‘Wunderbar’.It means wonderful. A wonderbra is a push-up bra. Wink, wink lol. Once again, I read your e-mail with great pleasure. For a “regte Hollandse meisjie”, your write perfect English in a very readable way and excellent style. One of the reasons is that I miss the African bush and African wild animals very much. Australia offers very little compared to the Southern part of Africa. I totally understand how you would miss the wildlife here. Only Africa has this vast amount of wonderful creatures big and small! Glad you are enjoying my blog and that the email sign-up is now working properly! You had to make a huge adjustment and you made it so well! 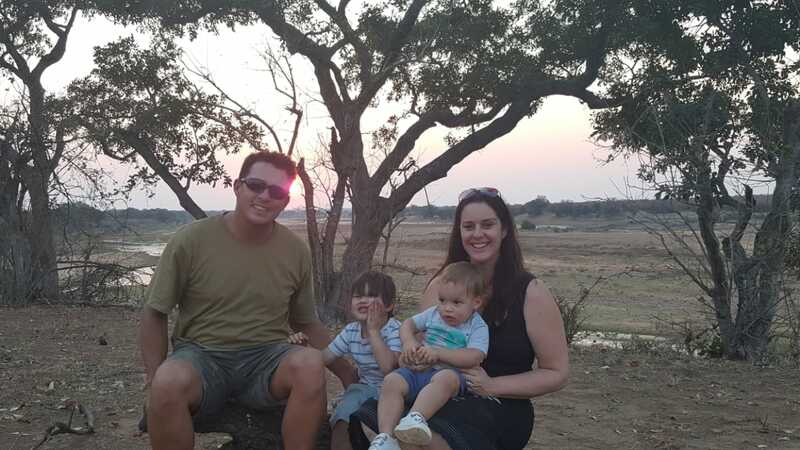 I’m so glad you did because now two more little Dutch South Africans are growing up with a love for and interest in the bush; also – selfishly – because otherwise we should not be enjoying your wonderful blog! I was delighted to see that you are thinking about a book . . . . Have a wonderful Christmas, hope it wont be too hot . . . . Thank you, Sal! A book… Can you believe it? Early days, but definitely considering it. maybe Steven and I should alternate chapters. Something like that. Let’s see. Linda reading your blogs make me realize more and that you and Stephen have been blessed with a gift. You realize it, we, your loyal fans, realize it too. However the bigger picture is that we all in our own ways have been blessed. Each of us must see that the little and big ‘wild animals’ in our lives come and go. Each has a purpose and we as individuals must learn to live with them. They make us stronger and make us appreciate life all the more. Thank you for your beautiful insights, stories and passion. Thank you so very much for your amazing comment! And you are very right! We feel truely blessed living where we do. And everything happens for a reason! May you have a fabulous Christmas with loved ones. Warm regards from Malelane Gate! Brilliant. Have a super christmas with your family. Baie dankie vir jou oulike stories. ek geniet die sommer baie. Geniet die Kerstyd saam met jou familie. Groetnis tot jou volgende storie. Bly jy geniet ons stories Gertruida! Geseende kersfees vir jou ook! Oh dear! Was it a dangerous one? Do you have a good broom? lol! Not a dangerous one, luckily. Collected it in a container so I could show it to Isabel so we can talk about it. As per usual, awesome story!! Going by the comments from your fans, I can clearly see the line of progression here. I now wait eagerly for the next dose of bush lore. You guys have a great Christmas and enjoy your trip, all the best and regards to Steven and the kids. Haha, I have to say I had fun writing this one!